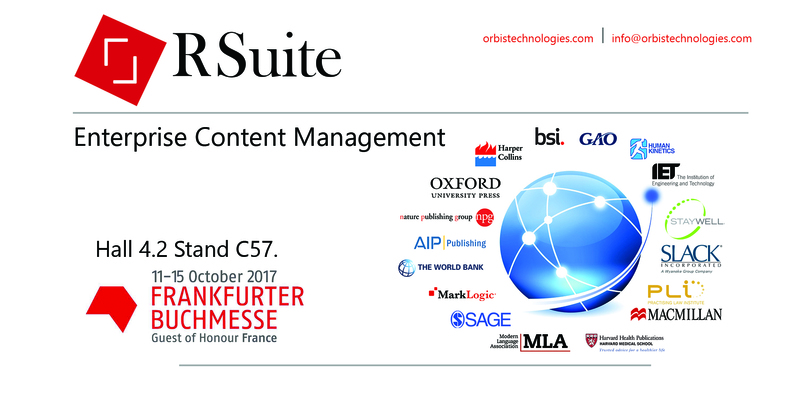 Annapolis, MD – Next week, the Orbis Technologies, Inc. team will once again exhibit at the Frankfurt Book Fair in Germany to showcase the brand new version of RSuite, the award-winning Enterprise Content Management solution. Leveraging the power of the underlying MarkLogic database, RSuite 5.3 provides semantic data management and embeds content visualization, which enhance its enterprise-strength content management and publishing automation capabilities to provide a best-of-breed publishing solution. To learn more about RSuite’s latest innovations and see a demonstration at the Book Fair, please stop by Stand C57 in Hall 4.2, or contact us to schedule an appointment. Orbis is headquartered in Annapolis (MD), with additional offices in Audubon (PA), Orlando (FL), Vienna (VA), and Chennai (India). The company may be found on the web at www.orbistechnologies.com.